Kudos to Reb Micha Berger! Why didn’t we catch up? Last Pesach ended in Israel on Friday, and in the rest of the world on Shabbos. Which means that in Israel, Acharei Mos was read that week, while we in chutz la’aretz (outside of Israel; chu”l) read a holiday portion, saving Acharei Mos for the next week. In a leap year like this one, the two reading schedules stay out of sync until Israel reads Matos and Mas’ei separately, and the rest of the world will have a double parashah. In a regular year, it waits until the summer, with Chuqas and Balaq. Notice that in either case, Torah readings stay out of sync through an earlier opportunity, the double parashah of Behar-Bechuqosai. So the question is frequently asked: Why don’t those in chu”l catch up as soon as possible? I want to explain why this is the wrong question. Our current schedule for Torah reading was set up in Bavel by geonim. At the time, Israeli communities were generally using a triennial cycle, in various variations. Starting and ending on Shavuos was common. Some would use a 3-1/2 year division, so that the Torah is read through twice per Shemittah cycle. The system was not designed for Israel. Therefore, those of us in chu”l reading the Torah portion for the eighth day of Pesach rather than reading Acharei Mos a week earlier were actually following the ge’onim. It is Israel that got ahead! And therefore the real question would be: Why don’t those in Israel fall back into schedule as soon as possible? But the question doesn’t get started, because there is no earlier double-parashah being read together in chu”l for them to split up. The question as usually posed is asking the people of chu”l to change what they’re doing to catch-up, but there are no changes that can be done in Eretz Yisrael to fall behind. Besides, it would be based on a false assumption. It makes sense to ask why those of us in chu”l wait until reading a double portion. After all, we should want to read as much Torah as we can. Torah reading should be like a child rationing his stash of candy — with a lack of self control in the early portions so that the later ones are tiny. And if we look at Nitzavim, Vayeilekh and VeZos haBerakhah, that seems to hold. But in any case, there is no reason to wonder why Israel doesn’t stall on reading less than they could get away with. There are four rules (SA OC 428:4) that determine when parshios are combined. One of them is that the last parashah before Shavuos is usually Bamidbar, except when it’s a leap year that started on a Thursday when it’s Naso. This year is leap, but started on Monday, so the geonic rule would have us read Bamidbar. In Israel, years like this one are tolerable because putting Shavuos after Naso is done in other situations, but it’s against the rules. People read the Maharit (shu”t, vol. 2, OC #4) as saying this is why people in chu”l don’t double upparshios to catch up to Israel. But really the teshuvah is explaining how the rule was designed, and why Israel’s situation is sub-optimal. 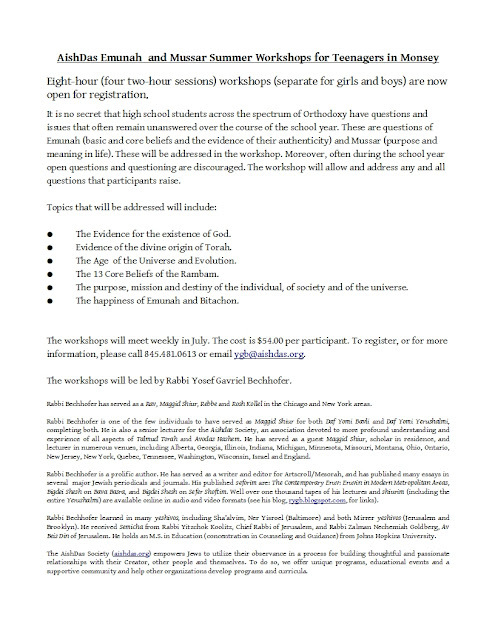 Eight-hour (four two-hour sessions) workshops (separate for girls and boys) are now open for registration. It is no secret that high school students across the spectrum of Orthodoxy have questions and issues that often remain unanswered over the course of the school year. These are questions of Emunah (basic and core beliefs and the evidence of their authenticity) and Mussar (purpose and meaning in life). These will be addressed in the workshop. Moreover, often during the school year open questions and questioning are discouraged. 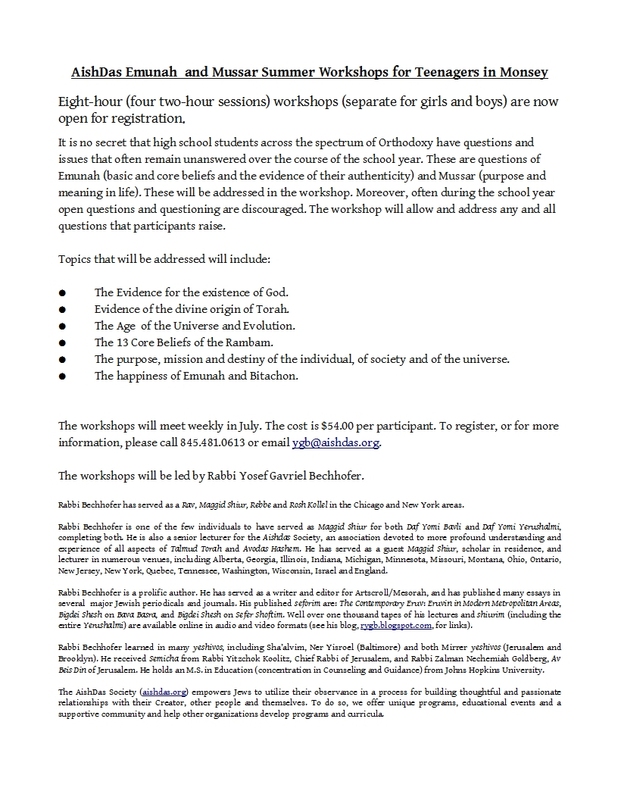 The workshop will allow and address any and all questions that participants raise. The Evidence for the existence of God. Evidence of the divine origin of Torah. The Age of the Universe and Evolution. The 13 Core Beliefs of the Rambam. The purpose, mission and destiny of the individual, of society and of the universe. The happiness of Emunah and Bitachon. 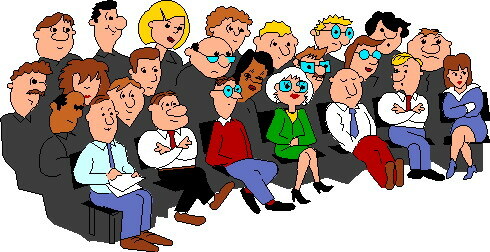 The workshops will meet weekly in July. The cost is $54.00 per participant. To register, or for more information, please call 845.481.0613 or email ygb@aishdas.org. The workshops will be led by Rabbi Yosef Gavriel Bechhofer. Rabbi Bechhofer has served as a Rav, Maggid Shiur, Rebbe and Rosh Kollel in the Chicago and New York areas. Rabbi Bechhofer is one of the few individuals to have served as Maggid Shiur for both Daf Yomi Bavli and Daf Yomi Yerushalmi, completing both. He is also a senior lecturer for the Aishdas Society, an association devoted to more profound understanding and experience of all aspects of Talmud Torah and Avodas Hashem. He has served as a guest Maggid Shiur, scholar in residence, and lecturer in numerous venues, including Alberta, Georgia, Illinois, Indiana, Michigan, Minnesota, Missouri, Montana, Ohio, Ontario, New Jersey, New York, Quebec, Tennessee, Washington, Wisconsin, Israel and England. Rabbi Bechhofer is a prolific author. He has served as a writer and editor for Artscroll/Mesorah, and has published many essays in several major Jewish periodicals and journals. His published seforim are: The Contemporary Eruv: Eruvin in Modern Metropolitan Areas, Bigdei Shesh on Bava Basra, and Bigdei Shesh on Sefer Shoftim. Well over one thousand tapes of his lectures and shiurim (including the entire Yerushalmi) are available online in audio and video formats (see his blog, rygb.blogspot.com, for links). Rabbi Bechhofer learned in many yeshivos, including Sha’alvim, Ner Yisroel (Baltimore) and both Mirrer yeshivos (Jerusalem and Brooklyn). He received Semicha from Rabbi Yitzchok Koolitz, Chief Rabbi of Jerusalem, and Rabbi Zalman Nechemiah Goldberg, Av Beis Din of Jerusalem. He holds an M.S. in Education (concentration in Counseling and Guidance) from Johns Hopkins University. The AishDas Society (aishdas.org) empowers Jews to utilize their observance in a process for building thoughtful and passionate relationships with their Creator, other people and themselves. To do so, we offer unique programs, educational events and a supportive community and help other organizations develop programs and curricula. The inaugural non-virtual conference of Orthodox Jews Against Discrimination and Racism.